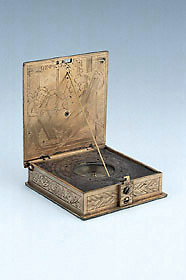 The outer side of the lid has a pierced lunar volvelle with aspectarium and indicates the twelve principal winds, 'AQVILO', 'BOREAS', 'VLTVRNVS', SVPSOLANUS', 'EVRVS', 'NOTVS', 'AVSTER', 'APHRICVS', 'ZEPHIRVS', 'FAVONIVS', 'CIRCIVS', 'CORVS'. The decoration consists of flowers and fruits in the spandrel spaces. The inner face of the lid has a symbolic engraving of 'GEOMETRIA' with a pair of dividers in her hands. Above the figure are holes for adjusting the string for latitudes 48?, 51? and 52?. Lines for common hours are engraved on a silver plate inside the box from 4 to 12 to 8 around the compass which is marked with the initials of the cardinal points 'SE', 'OR', 'ME', 'OC'. The hour lines are marked for the three latitudes mentioned above divided to the half-hour. The spandrel spaces are decorated with flowers and fleur-de-lis. On the bottom of the box is a table of latitudes for 24 places, and the edges are decorated with arabesques and geometrical motifs. On the catch is engraved the signature 'C ? T ? D ? E ? M ? 1613' [Christoph Trechsler der Elter Mechanicus].